A NO VOTE on the golf course proposal. This entry was posted in ArrowCreek, ArrowCreek 411, ArrowCreek411, FOA, Friends of ArrowCreek, Golf at ArrowCreek, Golf Course Purchase, Golf Purchase and tagged ACHOA, ArrowCreek, ArrowCreek 411, ArrowCreek Golf Course Land, ArrowCreek411, FOA, Friends of ArrowCreek, Golf Course, HOA, Homeowner Association, Homeowners Association. Bookmark the permalink. 13 Responses to This is the Deal: Please Vote! My my – such a prickly fellow. I have no further interest in you or this site for that matter. The chips will fall wherever, for better or for worse, and we will all move on. Mr Heaven why don’t you admit it your allegiance is to the FOA because you are a member of the golf club and your home back up to the golf course. You want all the rest of us ArrowCreek homeowners to bale out your beloved golf country club. It is a LOSER and has always been. We have lived in AC for the past fifteen years and it has never turned a profit. Members like you want to belong to a private golf country club, but refuse to pay to keep it profitable. How about kicking in 20K or so and paying a realistic monthly membership fee? You moved here from California, got a hell of a deal on your home because of the economy and demand more. Do you really think you could do that where you used to live? So please refrain from the BS and trying to impress us with your glib intellect! You are starting to sound like a broken record. I am not FOA neither do I live on the golf course or even have a view of it. Yet again you dispense false information. I do pay very realistic monthly dues, and have done for many years, and guess what? I “kicked in” a hell of a lot more than $20K. As for getting a “hell of a deal” on my house we bought 15 years ago and the sort of deals you are probably referring were not on the table then – but that is none of your business. My goal has always been not to necessarily persuade people to change their vote, but only to base it on having as much data as possible in order to make that decision – obviously pretty much a waste of time. With regard to the “glib” intellect, I only use that on occasion when dealing with the anonymous persons on your website too frightened to use their real names – hence deserving of some “tongue in the cheek” repartee, given on my part hopefully with a sense of humor. If you don’t know what repartee means, look it up. Donna and team. Whether the calculations are correct or not, I do believe it would be better served to state all of the numbers surrounding the other options. Our Board did an incredible job of looking at other options – primarily those of letting the course go brown or perhaps turning it into a park/walking trails, etc. It seems a major error of omission to not include this data with your recent post. Also, you state this new Board, if elected, would come up with other options. Very curious as to why the possibility of such options has been left to this late date. The only other one I have seen in 411 recent posts is to graze cattle. Brilliant! Grazing cattle would at least provide some off setting revenue for the debts to be incurred by ALL property owners in ArrowCreek and besides which the one item that kept being brought up by those opposed to a park or natural space, which your property faces, was that neither of those options had ‘off setting’ revenue sources and so it should be retained as a golf course. The Board estimates you refer to seem to leave out that they were provided, by FOA company members, especially the Green/Brown Moana estimates, and were not independent. In fact the integrity of most of the ‘Board studies’ should be carefully scrutinized as they were provided by organizations with close ties to those trying to ‘sell’ the property owners on assuming The Company’s debts. Other independent studies have been ignored by the ACHOA Board and ACCC, even after formally being presented to them, as they did not support the buying perspective. Another very viable option is to have ‘The Company’ donate the land, retaining the 50 acres and The Club, to an organization like Friends of Nevada Wilderness. That would certainly insure NO Development which CNA strongly supports. Truth hurts but it will win out. First of all, The Company can make such a contribution without the ArrowCreek property owners lifting a finger or assuming their debt load. As for fire abatement and ‘noxious/invasive weed control,’ apparently the fact that the PROPERTY OWNER is responsible for those functions, under Nevada Law, seems to have escaped the notice of many. The Company is currently held responsible for those items on its 525 acres, not the ACHOA. Should the property change hands, the ‘new’ owner would inherit that responsibility. As for a ‘pastoral’ atmosphere, we already enjoy that here in Painted Vista, don’t we. Let’s see if I interpret Donna’s team correctly. 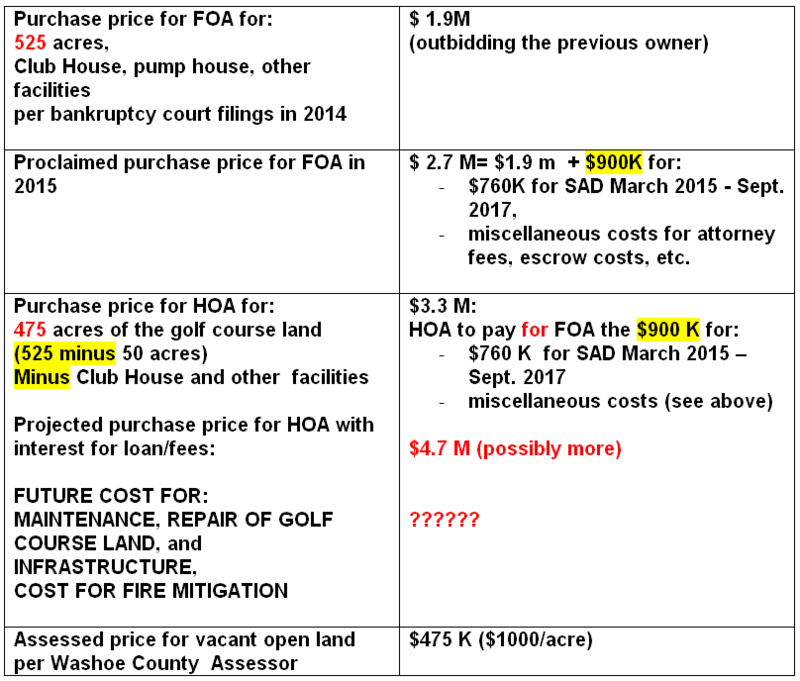 the FOA essentially paid $2.7M for the golf club, the HOA wants to purchase the golf club land for $3.3M (actually $4.7M+ given loan interest), which amounts to a $600K profit for the FOA and yet they still retain ownership of the clubhouse, what is it worth, another million or so? Given this and If the land is only worth $1000/acre (must admit, this sounds low to me) a no vote is a no brainer. Here in Somersett, in a similar situation, the HOA paid $2.75M for half the ArrowCreek acreage. However, ours also included water rights of purported significant value, so not an apples to apples comparison. The unknown is what will be the cost to homeowners should the golf course fail? I guess it all depends on what the HOA deems appropriate at the time. In this regard, as a goal for 2016, the Somersett HOA will be looking into contingency plans. It will be interesting to see what plans and associated costs they come up with. Too bad they had none identified prior to the purchase vote, other than they wanted to keep it as “green” space and out of the hands of “Developers”. ArrowCreek definitely has a contingency plan that will be in place IF the vote is to acquire the 475 acres. It’s called a ‘Dormancy’ clause. The ACHOA will maintain the property in a grassy state, you know water it and mow once a month, for up to a year while the ACHOA BOD decides what to do with it. IF it’s decided to turn it into something other than a golf green, then the ACHOA has to offer it back to the Club owner as part of a ‘new’ lease agreement. Personally, to save the cost of mowing, and since we’re allowed to have horses within the ACHOA, turning it into a pasture, horses, cows or sheep, although sheep would truly tear up the grass, would certainly fit within the green options of ‘dormancy.’ Then the ACHOA BOD could decide what to do with all of this additional acreage. Oh yes, if the club, which will be ‘FREE and CLEAR’ of all debt, after the ACHOA buys the 475 acres, should go BK, I’m reasonably certain a restaurateur will pick it up for a song. Leaving the ACHOA to continue to pay off the debts incurred from buying that 475 acres. Thank you Donna! We have been unable to attend the various meetings, but try to read all notices and postings. The factual information provided by the “no thank you” team and some of our personal contacts make it very clear as to the best course of action at voting time.